Teeth can become weak due to extensive damage to the teeth, or certain dental procedures, or worn from age or neglect. When this happens your dentist can fit a crown, which will protect the tooth against future damage for up to 20 years. Crowns then are ‘covers’ for our teeth that fit over the chewing surface and over and around the outside surfaces like a glove. This can be used then to cover abscesses thus protecting exposed nerves and preventing food from getting trapped inside the gaps between the cusps in our teeth. 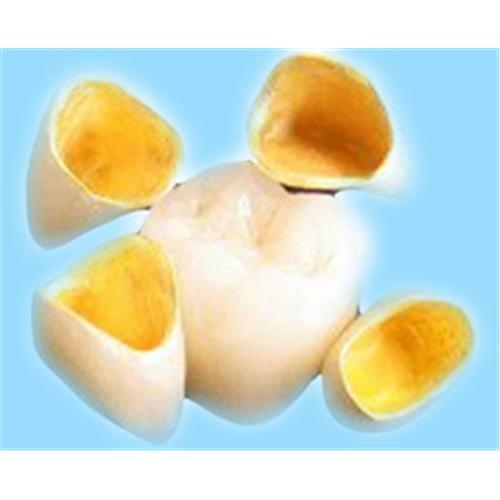 There are various options: gold crowns, metal crowns, resin crowns, porcelain fused to metal crowns and porcelain crowns. Porcelain is one of the oldest materials used in the dental field as it has many advantages such as the perfect shade reproduction and a good resistance to abrasion and chemicals. Because of these factors, porcelain is increasingly used for procedures such as constructing false teeth, full crowns and inlays. However, because porcelain is not as strong as its counterparts are, it needs to be thicker to withstand the amount of chewing it will go through. Therefore, your dentist will need to remove more of your own tooth to be able to fit the porcelain crown. At least 1.5mm to 2.0 mm from the occlusal surface (the surface of the tooth where is used for chewing) and all around the tooth. In some patients, although they were foretold about the procedure, could not imagine the outcome after the tooth was cut down. They were horrified as 1.5 mm may sound like a small amount right now, but when it is viewed after the procedure is done, it may seem like a huge amount of tooth structure were lost. It is always advisable, for both the dentist and the patient, to see a diagrammatic representation of the tooth after it is being cut down, or a video presentation. This can be useful to prevent any unwanted lawsuits or medico-legal disputes in the future. Both written and verbal consent should be taken from the patient if possible. Porcelain crowns are not as robust as the metal or metal fusion crowns and, as a result, have a higher incidence of brittle fracture where minute cracks form on the outer surface of the crown. According to the Crown and Bridge Department, Faculty of Oral and Dental Medicine at Cairo University, porcelain has a low thermal conductivity and these cracks form as it cools. The incidence of chipping your crown is also higher with porcelain. It is more difficult to get an exact fit where the tooth meets the gum — so fitting a porcelain crown requires a higher level of skill from your dentist. A good preparation of the tooth must also be done if the tooth has undergone root canal treatment (RCT) previously, and is undergoing a crown preparation procedure now. Sometimes, when the tooth is too badly broken down, extra strength is needed for the crown to be retained. A post and core will be placed inside the tooth before the crown is ‘gloved’ over it. If the post and core is made up of non-tooth coloured materials, the preparation of the tooth must be adequate so that the colours will not be seen through the crown after the crown has been placed. Make sure your dentist has adequate experience in using the processing technique as crowns are supposed to enhance the overall aesthetic and functional features of the teeth. But without good preparation, it will just make things worse. Cosmetic Dentistry states that “Gingival inflammation appears to be more common with porcelain crowns than gold crowns.” Efforts has to be put into maintaining the hygiene around the crowned tooth if the patient wants the procedure to be a success. The dentist will always tell the patients to floss their crowned teeth every day, but it is no surprise when patients who are diligent at first, will slowly forget to floss or becomes lazy. Contact your dentist if any bleeding of the gums occur — or if your gums become tender, swollen, shiny or develop a bright red or purple appearance. The cost of porcelain crowns can be prohibitive. As of July 2010, the average price of a crown was $945 USD, enough to negate the esthetic advantages for some people. The other option of treating a badly broken down tooth is extraction, and the patient might opt for that instead. Of course for many people the great advantage of having crowns that closely match their tooth colour is enough to outweigh the negatives. However this is of course a highly personal decision and it is up to you whether you agree with the outlook. Bear in mind these drawbacks when considering your options. This entry was posted in Oral Care and tagged aesthetic, brittle, cracks, gum inflammation, porcelain crowns, post and core, tooth preparation on August 17, 2011 by chzechze.